How should a follower of Christ engage the popular media culture? By becoming a mystic! Sr. Nancy challenges Christians today to delve deep into the rich theological tradition of the church as the root and foundation for recognizing the beauty of God present in all that is truly human. The artists of popular culture sometimes unwittingly seek transcendence while grappling with some of humanity’s most profound existential longings. The cultural mystics of today point out those needs of humanity in the culture’s artifacts in order to enter into dialogue with those who seek something beyond what this world satisfies. The anthropological-sacramental-incarnational paradigm presented gives us this ability to take a sacred look of the culture and offer the joy of the Gospel, Christ who is the answer of all humanity’s yearnings! This book can be ordered from Amazon here, or from Wipf & Stock, the publisher, here. Or you can visit any Pauline Books & Media center. For a list of locations, click here. Sr. Nancy Usselmann is a Daughter of St. Paul and the Director of the Pauline Center for Media Studies in Los Angeles, California. She is a media literacy education specialist and theologian, a national speaker, blogger, and reviewer of films on bemediamindful.org. 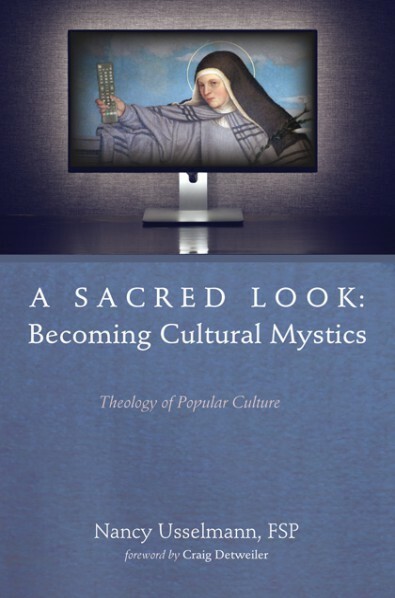 1) How did this idea of a "cultural mysticism" come about? In my studies and presentations on media literacy from a faith formation perspective, I've always seen the need to find that underlying theological connection between the two disciplines. And I found it in a type of mysticism that reflects on the popular culture discovering God's grace at work and pinpoints the entryway for dialogue. 2) Why do you have such an interest in the popular culture? I have always loved movies, music, and books and being a Pauline Sister, this is our field for ministry-the media! Hence, we are known as #MediaNuns. Besides being a field for ministry, I have often wondered how to bring the Gospel into such a secular culture. It really begins with finding those elements of commonality-the deepest yearnings and desires that reside in all human beings. And popular culture speaks to these yearnings through its art. It is that point of contact for the message of Christ to hit home, so to speak. 3) What impelled you to write this book? This book is the fruit of reflection and prayer for many years working in a media ministry. However, it really started to formulate during my graduate studies in theology at Fuller Theological Seminary where I my emphasis was on Theology and Art. Every paper I wrote had an element of popular cultural art and media references, so my thesis was a compilation of these reflections. Then I reformulated it for a book. And voilà! Here it is! 4) How would someone become a cultural mystic? It begins with a deep spirituality and relationship with God. In order to be a cultural mystic, one must also be attuned with the culture and its artifacts-film, television, music, social media, etc, in order to hear the, "cries of humanity" present there. It's about taking a sacred look at those cries and presenting Jesus Christ as the fulfiller of all those hungers that possess every human being. It requires attention to symbols in the cultural artifacts and the elements of grace that are present there in order to reflect deeply on the culture's yearnings and so bring those to our prayer and intimacy with God. 5) Who would benefit from this read? Anyone who is interested in theology, spirituality, and popular culture would hopefully find something in this book to entice them. It's academic but very readable with constant reference to elements of the culture. 6) What do you hope people come away from reading this? I hope people fall in love with God and his work in the world. I hope they become mystics who see with the eyes of faith the longings of humanity for that "something more," that desire ultimately for God. It is a passion of mine to be that bridge between faith and our media culture. I pray that this book makes that connection for those who read it.